Home > Browse by Artist (R-Z) > S > Smillie, James D.
James D. Smillie original etching "At Marblehead Neck"
Medium: original etching. Executed in 1883; this is a rich, dark impression on heavy cream wove paper, from the "Original Etchings by American Artists" portfolio, published in 1883 by Cassell and Company. The plate size is 5 x 11 7/8 inches. In excellent condition with full original margins. Signed in the plate (not by hand). 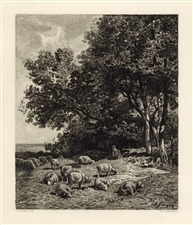 James D. Smillie original etching "A Fallow Field"
Medium: original etching. This impression on heavy cream wove paper is from the Sylvester R. Koehler portfolio of etchings, published in 1885 by Cassell & Company. Plate size: 6 x 11 3/4 inches. Signed in the plate (not by hand). James D. Smillie original etching "Up the Hill"
Medium: original etching. A fine impression in excellent condition on cream laid paper, published in 1880 by the American Art Review. Image size: 8 x 5 inches. Signed by Smillie in the plate (not by hand). 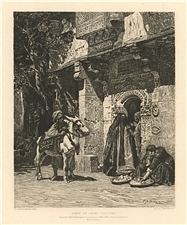 James Smillie | Frederick Bridgman etching "Lady of Cairo Visiting"
Medium: etching. Etched by James D. Smillie after Frederick Arthur Bridgman. Published in the 1880's by Estes & Lauriat. Image size: 7 3/4 x 6 3/8 inches with good margins. Signed in the plate (not by hand).